Economic and management experts and National Assembly (NA) deputies have called for relevant agencies to quickly improve a draft law on support for small and medium enterprises (SMEs) so that the National Assembly could pass it to create a legal foundation for SMEs to grow. Most of the participants at a three-day conference ending over the weekend in HCM City thrown their weight behind the draft law, saying it would provide much-needed support for SMEs in the country’s deeper international integration process. Economic expert Tran Du Lich said domestic SMEs have yet to get due attention from the government. He stressed no more delay in extending government backing to SMEs as they are key to the country’s economic growth. Lich said as SMEs play a crucial role in the development of supporting industries, the draft law should include incentives for supporting industries which have been promoted in recent years. In developed economies, credit, technology, human resources and market access are the four key drivers for economic growth. Lich called for the government to take them into account when mapping out supporting measures for businesses. Nguyen Van Phuc, deputy head of the NA Economic Committee, told the conference that besides financial support, enterprises want administrative procedures to be streamlined. To Hoai Nam, vice chair and general secretary of the Vietnam Association of Small and Medium Enterprises, said if there exist different supporting policies for SMEs, the law on support for SMEs should be adopted to ensure the consistency and feasibility of supporting measures for the sector. In other countries, local authorities rather than those in the upper echelons play an essential role in backing SMEs. However, the role of local governments is not yet emphasized in the draft law, so this should be made clear to make local authorities more active in supporting SMEs. A number of experts at the conference expressed concerns that incentives in the draft law will run counter to the free trade pacts to which Vietnam is a signatory. However, Lich affirmed it is not against Vietnam’s commitments to the World Trade Organisation (WTO) or the Trans-Pacific Partnership (TPP) trade agreement which Vietnam and 11 other Pacific Rim countries signed in February. He said incentives specified in the draft law are not subsidies and other nations also have specific policies for SMEs. Deputy minister of Planning and Investment Dang Huy Dong said the team responsible for drafting the law had studied international regulations to ensure it is in line with international practices and Vietnam’s commitments to free trade agreements. Dong noted that incentives are only given to efficient, growing and innovative SMEs. A proposal signed by minister of Planning and Investment Nguyen Chi Dung for the draft law said the government will provide a slew of incentives, including those relating to loan interest and corporate income tax. Under the draft law, commercial banks are allowed to set aside at least 30 percent of their loans for SMEs and offer them low-interest loans in line with development goals for the sector. The loan ratio for SMEs in the 2011-2015 period was about 25 percent of total outstanding loans at commercial banks. As of end-2015, outstanding loans for SMEs had totalled about VND1,052 trillion (US$47.15 billion), accounting for nearly 23 percent of the total. Startups could enjoy a 5 percent corporate income tax (CIT) lower than the common rate for a period of up to five years from the date of their inception. The draft law requires agencies and organisations using State budget for public procurement to use a minimum of 20 percent of the spending or 20 percent of their annual contracts for the products and services provided by SMEs. Besides, SMEs would be assisted in the startup years to improve production capacity, participate in value chains, innovate and integrate. According to the draft law, SMEs are defined as those having sales of no more than VND100 billion (US$4.48 million) or having headcount below 300 people in the year before they are evaluated. As scheduled, the draft law would go before the NA in July. Around 550,000 SMEs could benefit from the law if it is passed. 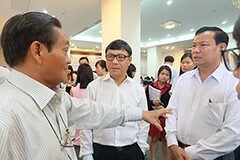 Lich said apart from SMEs, household businesses are other important contributors to Vietnam’s economy. In HCM City, many small-scale household businesses operate in supporting industries and play an important role in the city’s economic growth. Lich proposed adding household businesses as beneficiaries of the draft law. Meanwhile, some experts said the government is encouraging household businesses to operate as enterprises. If the draft law considers them as one of the beneficiaries, they could remain household businesses. In Vietnam, SMEs make up 97 percent of all businesses and contribute 45 percent to the nation’s gross domestic product (GDP), 31 percent to budget revenues, 31 percent to corporate investments, nearly 50 percent to economic expansion and 51 percent to job creations. They play a pivotal role in ensuring social welfare and poverty reduction.